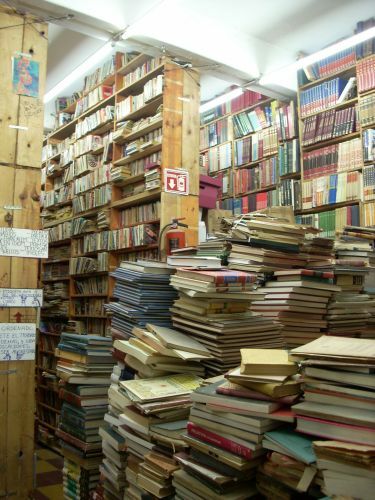 On Calle Donceles in the centro histórico, there are over a dozen second-hand bookstores. Obviously most of their stock is in Spanish, but each has at least a small section of books in English (and some in French and German). They are the detritus of the dead of the last century or so; a shopper can go back in time to peruse the forgotten titles that were the bestsellers of their day: Must You Conform?, What to Wear Where, The Case of the Grinning Gorilla. I've seen literally dozens of copies of John P. Marquand's The Late George Apley, Pearl S. Buck's The Good Earth and Vicki Baum's Grand Hotel. Even more of Be My Guest by Conrad Hilton seem to have washed ashore here. (Perhaps that is unsurprising as a copy was left in every Hilton hotel room for decades.) A 1947 novel by Walter Karig called Zotz has turned up variously on the street -- as it has at roughly half of the used bookstores I have ever been to in my life, all over the world. I've found little gems: Penguin editions of Wodehouse or Joseph Mitchell's McSorley's Old Ale House, both Butterfield 8 and Appointment in Samarra by John O'Hara, numerous Orwells and even more Graham Greenes. I have never been a collector and am completely ignorant about the value of old books. At one Donceles store, a friend and I came upon what appeared to be a first edition of The Great Gatsby -- Scribner's, 1925, in fair shape in what may have been its original binding. It was priced at 300 pesos, about $30 US. Neither of us had much cash on hand so we let it go. I returned for it the following day when it was, needless to say, gone. A rare book dealer in New York told me that even in so-so shape that book is worth fifteen hundred bucks.